I'm pretty relaxed when it comes to snagging up deals for holiday gift giving and while I've taken advantage of a few sales (including this one) I wanted to quickly pop in and share a few of my favorite items for bloggers this Christmas season. 1// Whitney English Day Designer - designed by mompreneur Whitney who I met at Alt Summit in January, I appreciate the form and function of this goal-oriented planner which addresses both work and family responsibilities. The style pictured is the one I ordered and is currently sold out but a few other designs were just made available today. 2// Jackery Giant+ - this is my new best friend! I now have no excuse to be without power ever which is so important as a blogger. I have to stay connected and this is super powerful, portable and affordable. There are smaller versions available but this is the one I have. 3// Holstee Manifesto - this comes in poster size as well as cards and is a powerful reminder to live your dreams. 4// Seagate Backup Plus Slim - I've lost a hard drive 2x and while the 2nd time I had it backed up the drive was super bulky so I upgraded to this and never looked back. 5// Bossy Ceramic Mug - a fun reminder, no? 6// Ponder by Kelly Moore - this new style comes in several colors and is a workhorse. I need a bag for my Mac Book Air, DSLR and my diaper clutch. This fits the bill! What's the #1 item on your Christmas wish list this year? 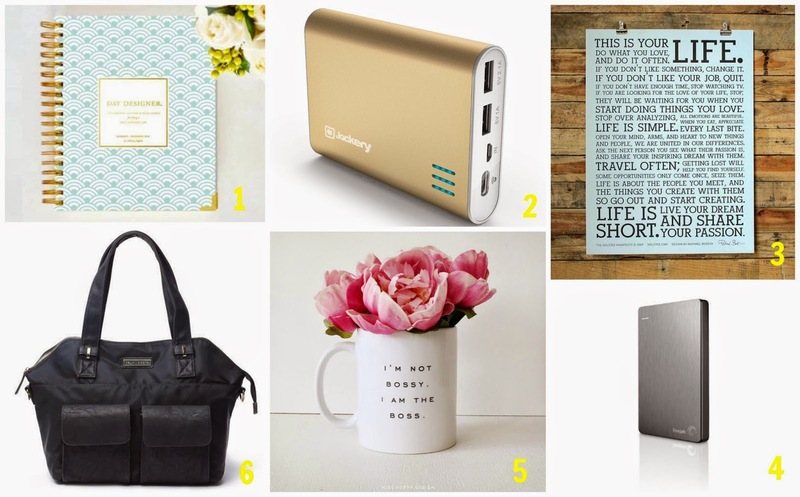 Any of the items on my wish list look familiar to you?